Sift flour and salt, add slices of cold butter, mix well, add oregano and water. Knead into uniformed dough. Roll out the dough, transfer to tart baking pan, poke with fork. Bake 10 minutes in 180 C degrees. Meanwhile, heat olive oil and fry onions. 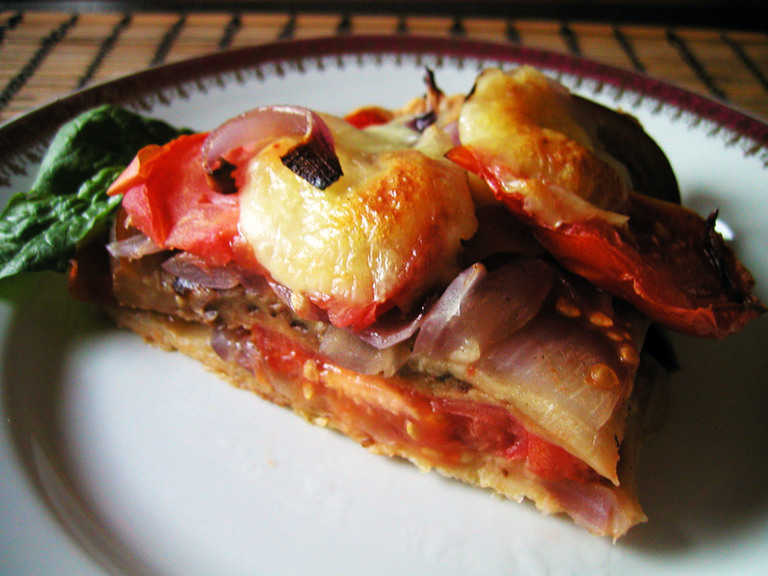 Remove tart from the oven, arrange part of onion, tomatos, eggplants alternately, sprinkle ocasionally with pepper, salt and herb. Place mozzarella sliced at the top. Return tart into oven, bake 15 minutes.